This part of North Shore Drive near Lake Whatcom is an innovative road that was recently repaved. Now that it's finished, I decided to ride out there. It's in our drinking watershed because houses and development have been grandfathered in around the lake for years. Actually over a century. Idealistically, no one should live in the watershed, but you know. How can they do that? Next step might be to try and make road surfaces pervious, rather than impervious. 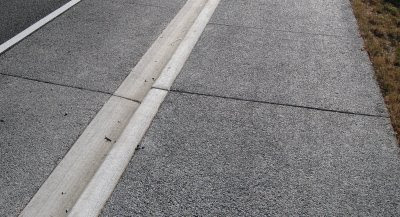 Pervious means rainwater can percolate through. Impervious means water just washes off. Around the lake, pervious means cleaner runoff. If water can soak through surfaces gradually, it can be filtered. On the other hand, when water runs off a hard surface too quickly it brings more crud to the lake. Why can't they make the whole road pervious? Well, I don't know, but my guess is it wouldn't hold up to the pounding of cars and trucks. Cars and trucks can be awful heavy. That's where the shoulder (also a bike lane) can come to the rescue. It doesn't need to be so hard since it doesn't normally get as much pounding as the car lanes. 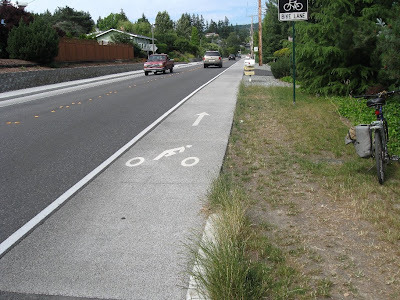 Make the shoulder softer so it can serve as a buffer between the car lane and the surrounding environment. Another good excuse for a bike lane. Even the sidewalk can be that new "previous" stuff. Another great innovation in planning. I also rode up onto Stewart Mountain which resides along the north shore of Lake Whatcom. Much of that route is under these ominous looking power lines. 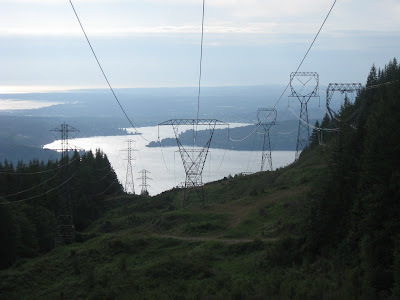 Big inter-tie between power grids of BC Hydro and BPA. Another link between US and Canada. Lake Whatcom below. Bellingham Bay in distance. One really hears the hum and crackle; especially from one set of lines. Power for millions of people passing through our area like Interstate 5. The interstate for electricity? Happy Fourth Of July. Humming, crackling, booming and sparking. Hopefully not arcing power lines through me. Ka-blam. I plan to watch fireworks from the top level of a parking garage in downtown Bellingham.